We think of our grandparents as venerable and wise, unlikely to be impulsive, reckless, or spontaneous as youth is wont to be. But what if we could see them as they were viewed by the generation older than they -- if we could see them as they really were in their younger days, not the way they present themselves through the foggy, faulty lens of memory. But what about my grandmother, Lisi? I always saw her as a powerful, no-nonsense woman, the antithesis of spontaneity. The opposite of ill-considered action. But that’s not the way her former employer, Mrs. Jickeli viewed her decision to join Josef in America. 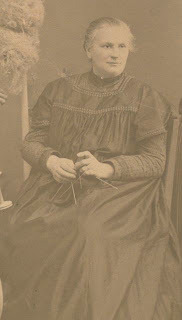 Forty-five years old at the time twenty-three-year-old Lisi left, Mrs. Jickeli’s first letters to her peg my grandmother as a foolish girl who acted too impulsively in rushing off to America to join her equally reckless husband. You can feel Berta Jickeli's frustration -- like a mother for her wayward daughter, hoping for the best, but harboring serious doubts that things will work out. I received your letter and the picture, and I am glad that everything goes well for you. With great anxiety, I let you go to your uncertain fate in such a foreign place, and it is good that up to now everything has gone better that we thought. Nevertheless, the fear and worry about you, who were my greatest problem child, has not lessened. When I see the picture, it proves to me that you are now a wife and so will be the victim of the painful and changing nature of life. From my entire heart, I wish that fate intends for you a gentle future and brings you nothing bad, and if you can write me over the next ten years that you still are satisfied, I will be truly happy and be glad that I was wrong. The circumstances in America are certainly very different and in many instances they will be difficult to get used to; in other cases, easy. 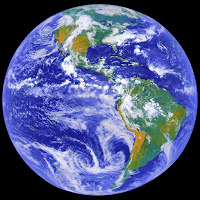 The culture of the wide [world] is certainly an enlightenment, and when you look around you and think of home, everything here will seem small to you. Above all you must beware that you don’t let yourself become homesick. Because if that happens to you, you are lost. The best would be to strive to forget your old home town and only think about the future. When you next write me, write me what you do the entire day. I often wonder, why [your departure] all had to be so outside the law [or proper way] and form, when in a half year everything could have been worked out in the right and easy way. If now it would only come to good! I am often with you in my thoughts and we also speak often of you. Our girls were completely crazy with joy when they saw your beautiful picture [undoubtedly the wedding photo]. Of course, Mrs. Jickeli didn’t realize that World War I was just around the bend, that Josef likely would have died in that horrid war, as did Lisi's younger brother, and that the life she knew in Siebenbürgen would soon come to an end. In this case, impetuous youth had made the wise, forward-looking decision. 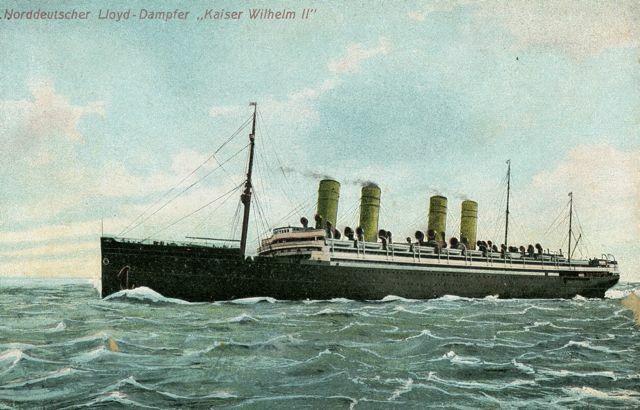 "This is my ship which brought me to America in the year 1911. A century ago this evening, at approximately 7:00 p.m., Elisabetha Ebner, aka Lisi or Eliess, my grandmother, disembarked from her ship, Kaiser Wilhelm II, in New York and started her life in America. I can see her searching for the train station to make her way to Cleveland, Ohio, where she would meet up with her step sister and brother-in-law before going on to marry Josef in Chicago. I love to think of these dates in cosmological terms. Just rewind the earth's orbit around the sun 100 times, and there she is: stepping off onto Ellis Island, submitting to the probing and eye-lid lifting health inspections, mailing a postcard of Central Park to her sweetheart, my grandfather, Josef Gartz, to let him know she's arrived safely. Because of blogging, I've had a great time getting to know more people interested not only in genealogy and family history, but also in writing memoir and family stories, which is the ultimate goal of my research through my family archives. So I was so thrilled when one of the most active memoir bloggers, Lynette Benton, (See Lynette Benton On Writing) asked if she could interview me about my interest in family history and memoir. If you haven't seen Lynette's blog, check it out. 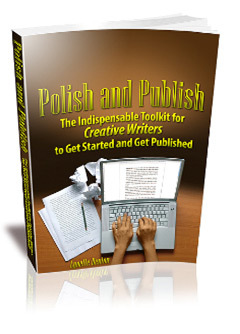 She offers all sorts of savvy advice, from the basics like finding the time to write, and providing writing prompts to get the juices flowing, to analyzing just what makes a memoir resonate for her. The latter two are family histories, which are more comprehensive than memoir, which is intended to focus on a specific time period or theme. Inventing the Truth: The Art and Craft of Memoir, edited by William Zinsser (several brilliant memoirists, including Kerr-Conway, Baker, and Frazier) discuss how they did it. Lynette regularly has guest bloggers, published authors who share how they crafted their prose, created their characters, or kept going despite coming to hate their books! We all know that feeling. Her book, Polish and Publish offers advice on the tools, tactics, and strategies to take your writing to the next level and ultimately get published. Take a look! Free Sandwich with that Beer! Mr. Offelke put an ad in the Abendpost, a German language paper. The title literally means the “Evening Post.” Josef Gartz, along with several other men, applied. 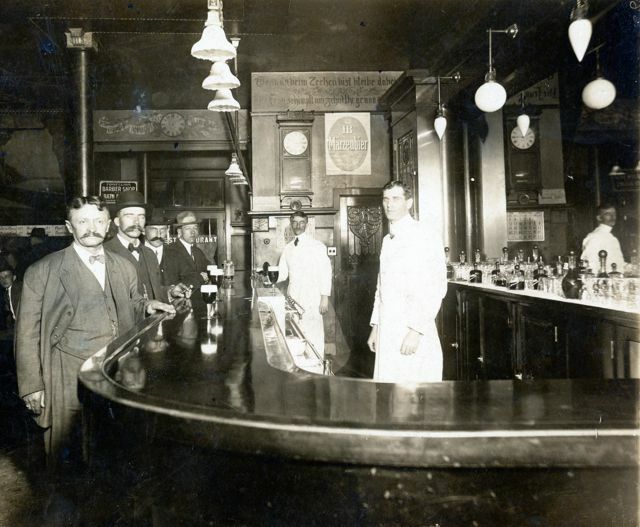 Mr. Offelke picked my grandfather out of a line-up of applicants and gave him the job of “sandwich man,” in this saloon. In the close-up below you can see the calendar, (I was able to see the whole page in the mirror reflection in full photo above. It was October, 1912. The clock in the background (above his head in the wide shot) shows it’s 2:30. I'm pretty sure that would be in the afternoon). Plenty of men (no women) are drinking. Much of the signage around the place is in German, and they are literal “signs” of the times. 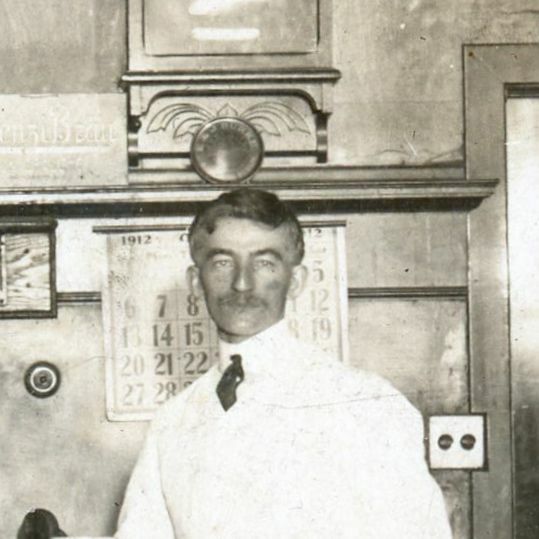 Detail: Josef Gartz with October, 1912 calendar behind him. One sign says: “First Class Barber Shop and Bath," with an arrow pointing down the stairs in the back. One of the most important aspects of this job for my grandfather was that he could eat all day long, cutting way down on his food expense. It’s also because of this job that he eventually moved his family to Chicago’s West Side, to the neighborhood called West Garfield Park, where my dad, and eventually all his children, grew up. A year later [after her arrival in Chicago in 1911], my husband got a much better job in a fine place where one could get a glass of beer for 5 cents and with it got a meat or cheese sandwich for free. That was my husband’s job -- to cut the bread and lay ham, beef, or cheese on it and give it to the men with their beer. He earned $15 a week. Then we got a four-room apartment for $12 per month. Now we could save money. Wow! Josef was earning twice what he made working at his previous job buffet. They were on their way to putting money aside, which became a central value in their lives. Work hard. Save money. It would serve them well as they began to raise a family in tough times. 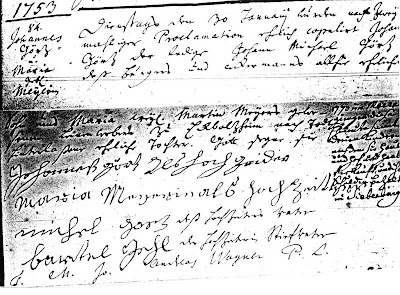 The first Görz to arrive in my grandparents’ homeland of Siebenbürgen/Transylvania made the 1,000 mile trek from Gerstheim in Alsace in May, 1770, but to Grosspold, not Neppendorf as the Lutheran church records there had stated. It was the baby on this journey that ended up being the first Görz, later Gärtz to populate Neppendorf, my grandfather's home town. 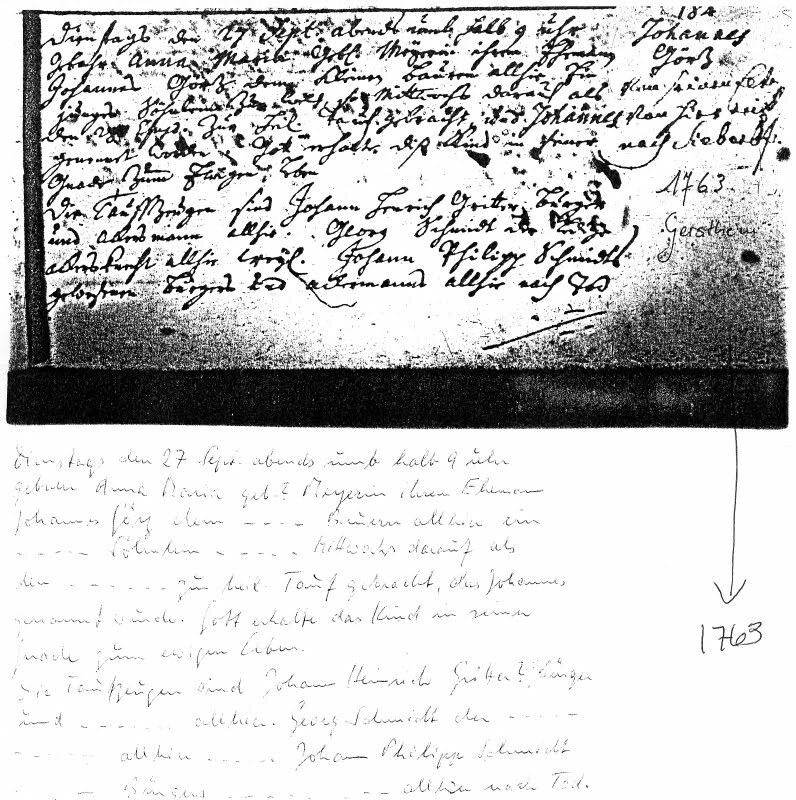 In the last post we found out that my cousin Maria obtained copies of four microfilmed entries from the Gerstheim Evangelical Lutheran Church in Alsace, whence came Johannes Görz my grandpa Josef’s great, great grandfather (my g-g-g-g-grandfather). But these documents were much more challenging to make out than the church family books, such as shown at right, which we saw in Lisi Ebner's Grosspold church, laying out birth (der Geburt), marriage (der Trauung), and death (des Todes) in nice neat columns. Each life event was worthy of at least a paragraph of indecipherable handwriting -- not just a dated entry, which makes them rich sources of family information--if you can find someone to de-code the writing. 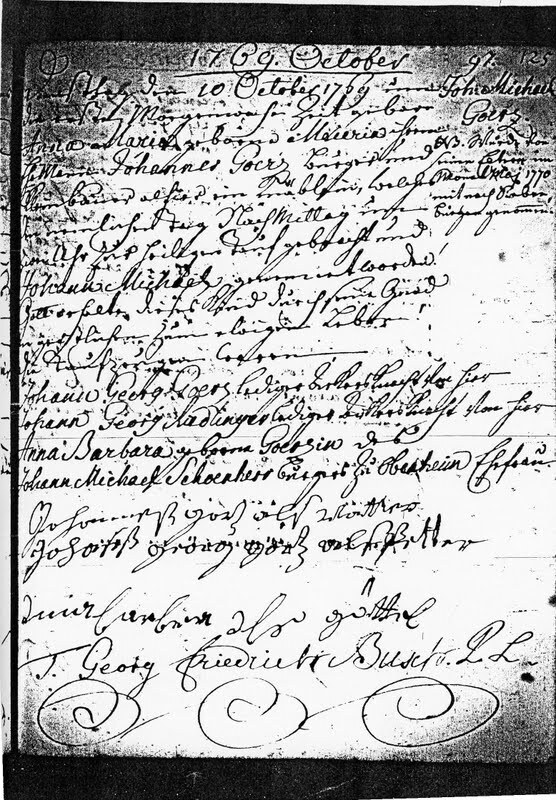 First off, Görz, Goerz, Goerz, and Görz all seem to have been accepted spelling of this family’s surname in the Gerstheim records, and all would be pronounced identically. (I never knew about this varied spelling before my trip to Romania in 2007). 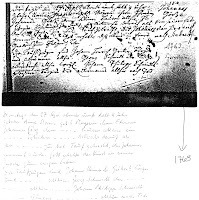 On Tuesday, January 30th, after two prior announcements [a marriage had to be announced ahead of time to allow anyone to object] Johannes Görz, the unmarried son of citizen and inhabitant here, married Maria [Actually Anna Maria], daughter of Martin Meyers, now dead, from Eckbolsheim. God bless them. NOTATION: In May, 1770, this married couple, together with their children, emigrated to Siebenbürgen after they sold their home and grave* and paid all their debts. Eureka! This information confirms what I had seen in another genealogical reference, which states that "Johann Görtz with 5 Persons left Gerstheim and emigrated to Grosspold" (coincidentally, my grandmother's town, more than a century later, in Siebenbürgen/Transylvania). *Note: Meta said that people would buy a grave ahead of time, holding on to it for 15-25 years for any family members. When they leave the area, they can sell the grave plot. Tuesday, September 27th at 8:30 pm Anna Maria, born Meyerin, bore her husband, Johannes Görz, a small farmer [one with little land], a little boy, who was baptized on Wednesday and named “Johannes.” May God keep this child in his grace into eternal life. Tuesday, June 19,  at 9:30 a.m. Johannes Görz, born to small farmers Johannes and Anna Maria, born Meyerin, died and was buried in the Christian manner toward evening. Rest in Peace. Age 8 months, 3 weeks, 2 days. 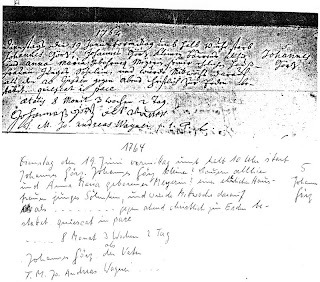 Tuesday, October 10, 1769 at daybreak, Anna Maria, born Meierin (a phonetic spelling of Meyerin) bore for her husband, Johnannes Goerz, [the spelling changes-but pronounced the same] citizen and small farmer, a little boy, who was brought to baptism on the same day at 2 pm and named Johann[es] Michael. God hold this child in his grace to eternal life. In both births, notice how the mother “bears [the child] for her husband!” It seems she was given little credit for doing all the work! From this Michael Gerz from Alsace, who married in Neppendorf, originate all the inhabitants of Neppendorf with the family name “Gerz” [later spelled Gärtz]. 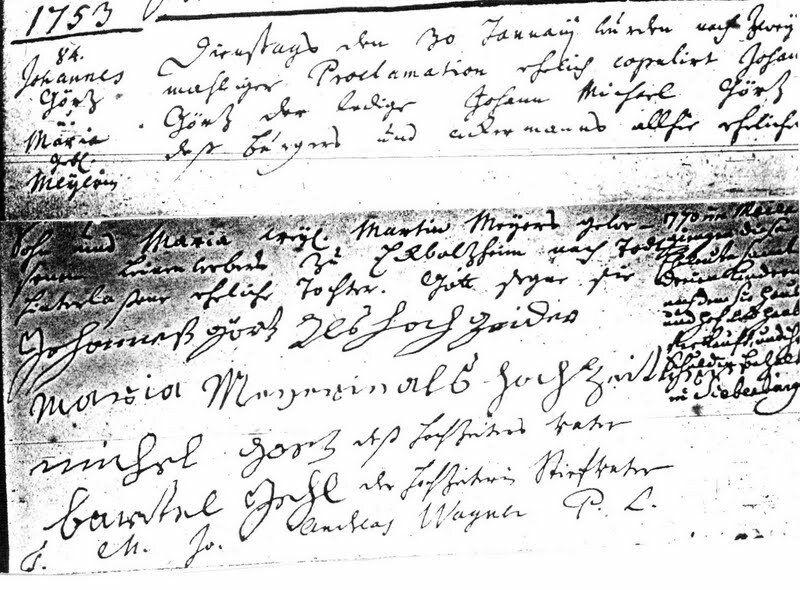 So...[Johannes] Michael was taken to Grosspold as an eight-month-old baby with his family in May, 1770, but then he married in Neppendorf, and became the patriarch who eventually led to my grandfather, Josef, who also chose to emigrate -- 140 years later--to a much more distant land. but its records have been microfilmed. So who was the first bold soul who started the bloodline of “Görz/Gerz/Gärtz in Neppendorf (my grandfather, Josef's home town) after trekking the 1,000 miles from Gerstheim in Alsace to Siebenbürgen/Transylvania, where hundreds of thousands of other ethnic Germans had made their home since the 12th century? He was an eight-month-old baby! It took a village to make this discovery, and I’ve been lucky enough to have “villagers” come forth to help when I least expected it. In the last post I described how my brothers and I received a genealogy of the “Gärtz/Gerz” family when we visited my grandfather’s church in Romania (see Churches and Spilling Secrets. 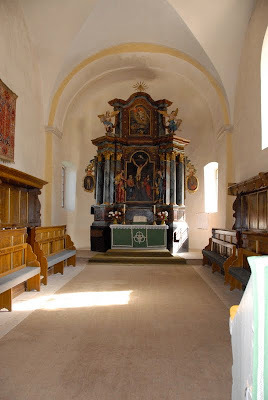 The Neppendorf Church's genealogy stated that “Michael Gerz,” born in 1771, emigrated from Gerstheim in Alsace and was the guy from whom all others with the name "Gerz/Gärtz -- even Görz/Goerz" in Neppendorf came from. I wanted to learn more about the family's roots in Alsace. Enter Monica Ferrier, a specialist in emigrants from Siebenbürgen to North America, (Monica helped me find the ship that brought Josef Gärtz to New York. See Mystery of the Missing Manifest). In an email exchange with Monica about the Gerz/Gärtz/Görz/Goerz family origins in Gerstheim, she sent me this detail from a reliable genealogical reference source known as W & K (for Wilhelm und Kallbrunner, the authors). WK 326.56 Johann Gortz 5 Persons. Farmer left Gerstheim in or around 1770 for Grosspold. 2. What about the name? 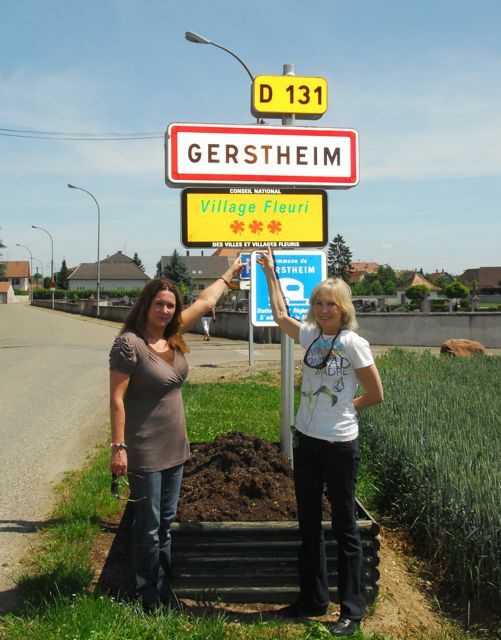 The Görtz vs Gerz is a no-brainer -- varied spellings on phonetically-identical names. 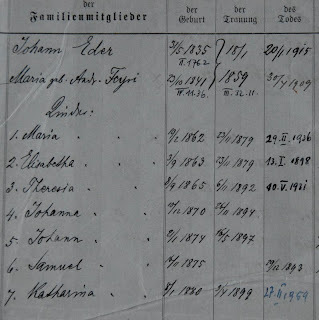 But the emigrant in the above record is listed as Johann -- and he went to Grosspold -- my grandmother’s home town, not Neppendorf, where the Gärtz clan settled. 3. What about “Michael” who was supposed to be the “first” Neppendorfer? The Neppendorf church genealogy noted his father's name was “Johann,” and this record shows: "Johann Gortz - 5 people” went to Grosspold. Could that be Johann, his wife and three children? Was Michael one of the children who then later moved to Neppendorf? 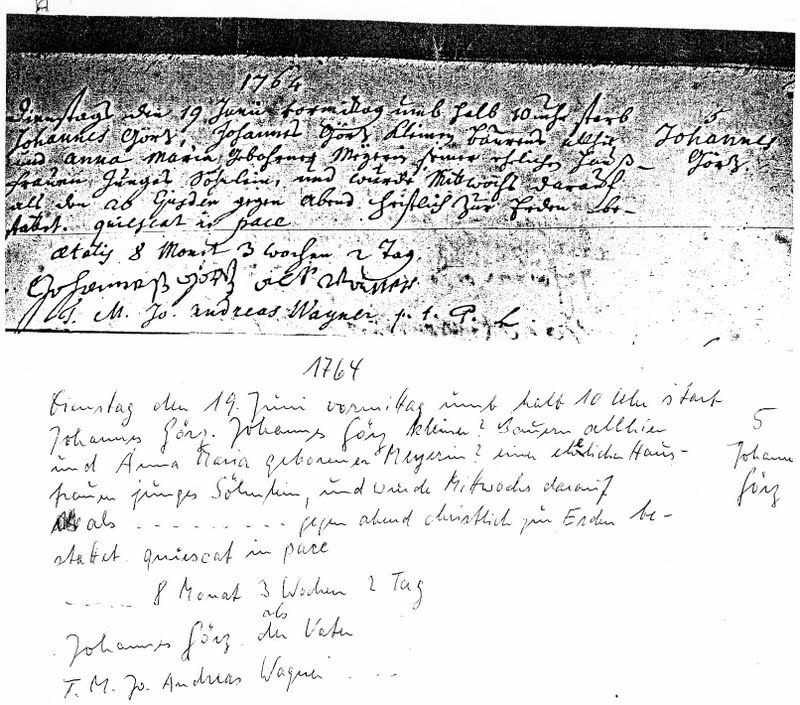 Time to look at the original church records from Gerstheim. Enter cousin Maria Gärtz who grew up in Neppendorf, in the same house in which my grandfather had lived. Several years back, Maria had hired a researcher to retrieve some family-relevant church documents from the Evangelical Lutheran Church in Gerstheim, Alsace. She sent me copies of the four separate print-outs from microfilm files dating back go 1753. Here’s what one looked like: mostly impossible to read! Time to get my Rosetta Stone, Meta involved. 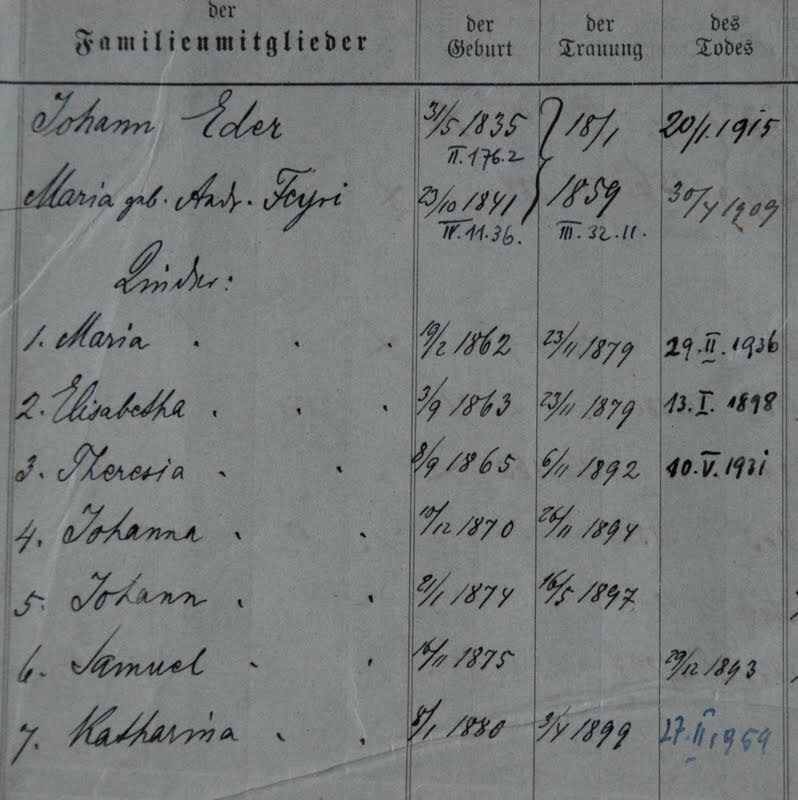 Thanks to my “village” of helpers, I was able to make sense of this mixed up genealogy, learned details of my ancestors’ lives, and discovered how an 8 month old baby became the first of the Goerz/Gärtz clan in Neppendorf, and my g-g-g grandpa. 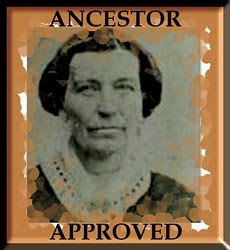 It takes a village to find an ancestor! I welcome your comments in the box below. However, I will not have access to the internet for a couple weeks, but I will reply after 9/16. If you have any trouble commenting (it seems some often do), please email me at lindagartz@gmail.com as to what's going on and I'll try to see if there's a pattern to the trouble. Thanks!